Just this past month a frequent visitor to the library came by to conduct some research and was stuck by and pleasantly surprised to find a resource at the American Philatelic Library (APRL) that hadn’t occurred to him that we would collect or include as part of our collection. There on the first floor of the public space of the APRL tucked between a row of U.S. and international government documents and our collection of domestic show programs is a single bay of 24 shelves housing a small but growing collection of U.S. and international stamp albums. At first glance this collection of stamp albums, usually considered philatelic material meant possibly for resale in the gift shop, may seem to be an odd choice for inclusion in what is ostensibly a research-oriented philatelic literature collection that includes primarily books, journals and auction catalogs as well as the aforementioned government documents and show programs. After all, what research value could old stamp albums have for the serious philatelist? The answer to that question isn’t as complicated as their discovery at the APRL may seem. Stamp albums provide a wealth of information for not only the beginner collector but also the serious philatelist. 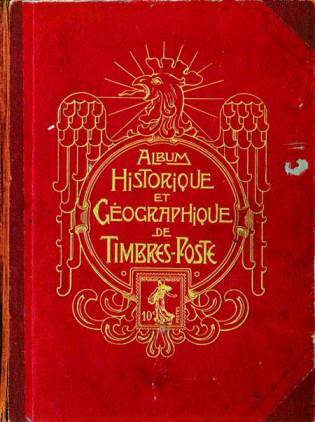 Albums were often the collector’s first introduction to the hobby providing not only a structure and organization to their collecting, but also supplying them with the requisite illustrations and in some cases further information (i.e. stamp catalog numbers, watermarks, perforations, etc.). As a research tool, stamp albums enable the researcher to determine how stamps were categorized and classified over time. The majority of albums published both here in the U.S. and worldwide, like the Scott albums for example, included pages for all regular officially issued stamps of various countries. But just as collectors became more specialized in their collecting, in time stamp albums began appearing that were more highly specialized as well. 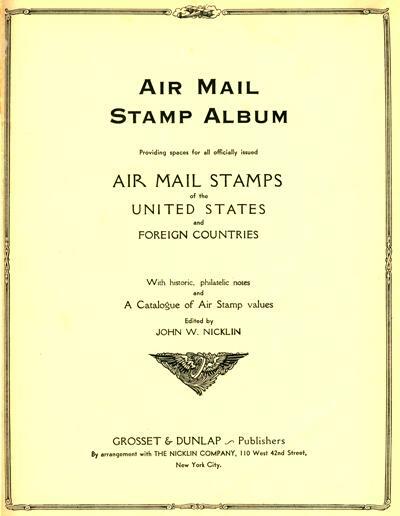 As demand grew albums began focusing on specific types of collecting interests such as back of the book issues like air mail stamps, plate blocks and revenue stamps to name a few. Often entire albums were devoted to these specialized collecting interests for either a particular country or for worldwide collecting. Similarly as topical collecting grew and became more popular among collectors, stamp albums comprised of a number of topical collecting interests began appearing and were produced. In some ways it can be argued that stamps albums provide a window for researchers into the history of how collectors collected and what they chose to collect. At the APRL the stamp album collection is comprised of over 80 single copies of a wide variety of domestic and international albums. There are albums for standard regularly issued postage stamps in the collection as well as copies of albums that involve topical collecting or a wide variety of more specialized collecting. 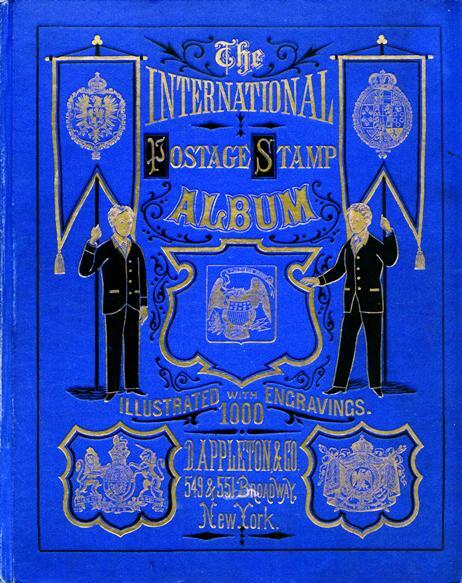 The albums often include very little of the original philatelic material in them as these albums have been donated to the APRL and have either had the majority or all of the original stamps removed. Even as empty albums the purpose for their being in the APRL collection is as historic examples of the unique types of albums that were produced and available at one time as well for their unique research value documenting the history of collecting. To access the APRL’s collection of stamp albums you can visit the APRL in person or contact us at either library@stamps.org or 814-933-3803 ext. 240. Albums can be viewed in person, borrowed or pages can be copied or scanned from them as requested. I agree that these albums (and their pages) can likely offer valuable knowledge for the collector. In my experience — the general quality of the stamps contained within can often be foretold by the album. Beyond the cover, but still during this initial phase of evaluating a collection, my next step is to check the copyright date, and then to figure out the end date for coverage — basic albums are often updated through supplements. I covered many similar points in my American Philatelist article, “Judging an Album by Its Cover” (October 2010, p.914). The focus of this article was the evolution of the Scott International album. One of my primary data sources was the information found resident in the annual Scott catalogs. The APRL’s “run” of these catalogs (and advertising therein) were helpfully researched by Ellen Peachy (APRL Library Services Coordinator at the time). I expect many of the APRL’s albums could also provide clues along these same lines. Thank you for your reviews and comments. Nice to see some focus on Albums. I’ve recently delved back into the hobby since leaving it in my teens. Finding a decent album and configuration of mounting, page layout solutions with an eye for aesthetics has been difficult. I don’t think it controversial to say that much of the community are stuck behind the times regards style and design. Anyway, I’m likely going to create my own album from scratch. Not for everyone I know, but for me the presentation is almost as important as the content within. The older turn of the century albums include illustrations of many more items that present day albums leave out. Such as wrappers,envelopes and earlier illustrations of many stamps,eg. 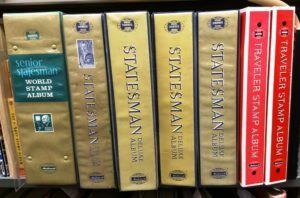 Afghanistan,India states, British Colonies, etc.I try to buy some of these older albums for the information so as to improve my knowledge of the philatelic world. I also realize that todays albums would be probably cost prohibited or too much for the general collector that does not get into the back of the issues.